Jesus took Peter, James, and John to the top of a mountain to show them who He really was – not just a great prophet, but God’s own Son. 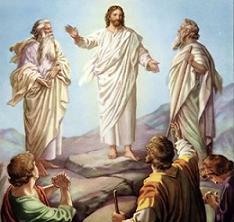 Moses representing the Law, and Elijah representing the prophets, appeared with Jesus. Then God’s voice singled out Jesus as the long-awaited Messiah who possessed divine authority. Jesus would fulfill both the Law and the prophets. Peter and the others had fallen asleep. When they woke up, they saw Jesus’ glory and the two men standing with him. When Moses and Elijah had left, Peter said to Jesus, “Master, this is a great moment! Let’s build three memorials: one for you, one for Moses, and one for Elijah.” He blurted this out without thinking. Now he understood that Jesus is the name of above all names and only He could be the cornerstone of the church. So, come down from the mountain into the valley and walk with the Lord and do His work on this earth until He comes again to take us back up on the mountain top called Heaven.